This was a random discovery on the library shelf, and turned out to be very intriguing. 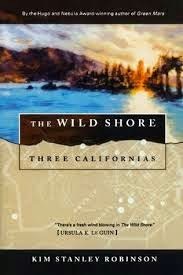 Written in 1984, this book tells the story of a community of nuclear war survivors in the year 2047 on the Pacific Coast in California. The book is part of a trilogy, where each book imagines an alternate future for Orange County, where the author grew up. In this first installment, we learn about the small community of San Onofre and how they have managed to survive and rebuild following a nuclear attack on the United States in the late 1980's. Through the narrator, Henry, we slowly become aware of the situation in the outside world, and how it might affect the relatively isolated and hardworking group of people in San Onofre, and the peaceful way of life they've been able to establish. Henry is a young man, and this novel is also the narrative of his coming-of-age, and how he grapples with responsibility and comes to terms with the consequences of his and others' actions. I always enjoy reading imaginations of what the future might look like, and so enjoyed this novel, as the author's ideas of what life in 2047 could be were well thought out and sometimes sobering to contemplate. Detailed Wiki page on this book here.